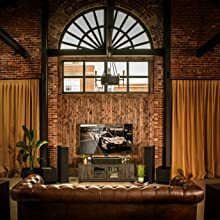 When building a home theater system, your center channel speaker ensures the dialogue in your favorite movies is crystal clear. 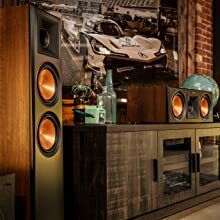 The RP-400C is the entry-level center channel speaker in Klipsch’s updated Reference Premiere line, leveraging Klipsch’s 70-year experience with acoustic engineering and innovations such as the Tractrix 90-by-90 horn and dual Cerametallic low-mid drivers. Add to that an updated design and tweeter, and you get a center channel that pairs clarity with solid imaging so you can hear every whisper, shout, and syllable. 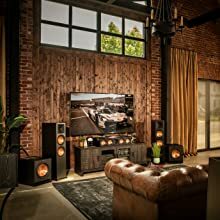 And it blends seamlessly with its siblings across the Reference Premiere line, both sonically and stylishly, for a cinematic experience in any space, no matter the size or shape. A core design element in Klipsch speakers, then and now, is the horn. Flared 90 degrees vertically and horizontally, the unique Tractrix horn acts as acoustic amplification for the high-frequency driver (a second Tractrix horn fires out of a rear bass port). The horn not only makes speakers such as the RP-400C highly efficient, but also steers the highs for precise localization of instruments and dialogue – especially important in the center channel. The Tractrix horn, molded of compressed silicon composite and fitted with a phase plug to reduce resonances, places listeners in the middle of the action or at center stage. 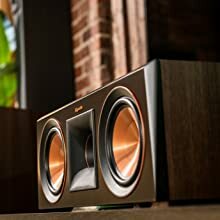 Even before you power it up, you can always spot a Klipsch thanks to the emblematic copper-colored cones. 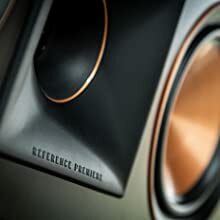 The dual 4-inch low/midrange drivers in the RP-400C are formed of Klipsch’s proprietary spun-copper Cerametallic material, which adds stiffness while subtracting weight for superior transient reproduction and high efficiency. And the rear-firing Tractrix horn port strengthens the bass further still. 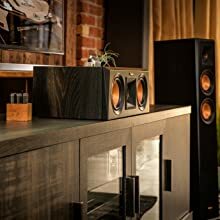 Klipsch’s horn-loading and ported design, combined with ultra-light and ultra-responsive drivers with custom coils and magnets, means that speakers such as the RP-400C can reproduce the full dynamic range of today’s movie soundtracks – and match perfectly with the majority of today’s home-theater receivers and amps. The cabinetry is made of solid MDF material reinforced to reduce resonances, with your choice of ebony or walnut scratch-resistant finish. 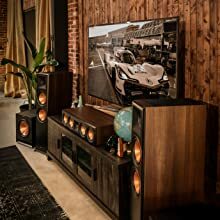 Combined with the unique look of copper cones, laser-etched logo and flared horn, the RP-400C looks right at home right under your flat screen, whether the attractive and flexible magnetic grille is attached or removed. And the RP-400C is sized to sit unobtrusively under any modern set. 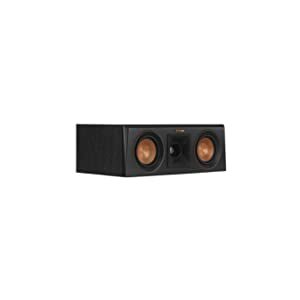 Dimensions (H x W x D): 5.6" x 16" x 9.65"
Get crystal-clear sound for your movie dialogue and music lyrics with the incredible acoustics of the Klipsch RP-500C center channel speaker. Our proprietary Tractrix horn-loaded technology gives you a lifelike, front-row listening experience. 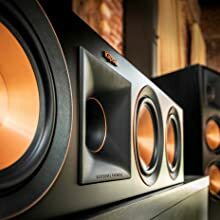 Klipsch proprietary Tractrix horn-loaded technology ensures high-frequency energy of the Reference Premiere center channel speakers are aimed directly at the listener and reduces unwanted, artificial reverb caused by indirect sound bouncing off walls - meaning you experience the most clear, detailed, lifelike sound possible. The vented tweeter housing reduces standing waves that create unwanted harmonics, resulting in enhanced detail and clarity in high frequency reproduction. A signature feature on the Reference Premiere series, Cerametallic woofers are rigid and lightweight for minimal distortion and maximum efficiency. When paired with the Tractrix horn-loaded LTS tweeter, it provides the highest speaker efficiency in its class.